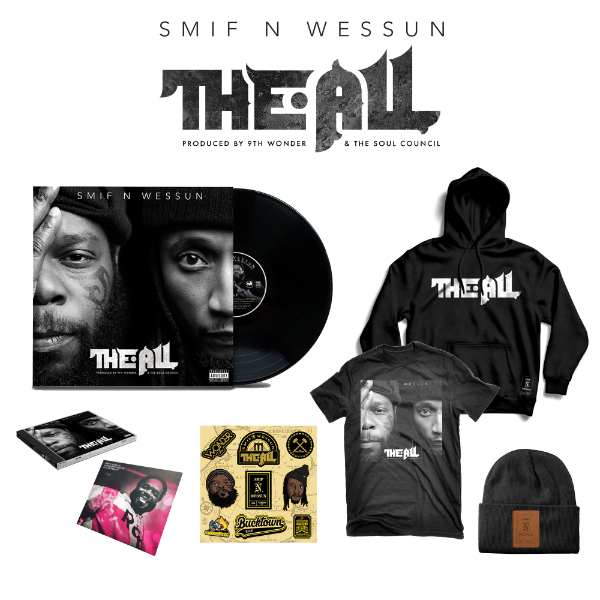 The ultimate Smif N Wessun ‘The All’ collector’s bundle. Own the album + a limited-edition album art T-shirt, 6” sticker pack, CD, vinyl, beanie w/ leather patch & hoodie. In addition to ‘The All’ album, you will also receive a free digital download of Smif N Wessun & Champion Sound ‘Live From Prague’ album featuring live performances of: 1) Bucktown USA, 2) Let’s Get It On, 3) Stand Strong, 4) I Love You (Remix), 5) Wontime, 6) Black Smif-N-Wessun, 7) And So, 8) Black Trump, 9) Monumental, 10) P.N.C. 11) Roses, 12) Gotta Say It, 13) Wreckonize, 14) Champion Sound Interlude, 15) Bucktown, 16) Super Brooklyn, 17) Sound Bwoy Bureill, 18) D&D Soundclash backed by the band, Champion Sounds.